The New Motorola smartphone for Verizon is now official. Named Motorola Droid Turbo, it is a high-quality products built with innovative materials, and powered by a last-gen processor. There are many areas which should attract customers’ attention. Firstly, the Droid Turbo is durable, water resistant device. Using non-conventional materials like ballistic nylon or metalized glass, the smartphone offers high-quality protection against accidental falls. Moreover, the US carrier will replace the phone if the screen cracks but keep in mind it’s a one-time replacement. Secondly, the new Droid is fueled by a massive 3900 mAh battery which should give you enough power for a full 2 days of usage. Turbo Charger support gives you 8 hours of battery life if charging the handset for only 15 minutes. Another area where the Droid Turbo shines is the display department. With a brilliant 5.2inch Quad HD screen, the smartphone offers an impressive pixel density and level of details. The other innards are top-end too. On the back side the phone has a 21MP camera sensor with f2.0 capable of 4K video recording. The processor is a quad-core Snapdragon 805 running at 2.7 GHz backed by 3 GB of RAM. Internal storage is said to be 32 GB or 64 GB. Sales start tomorrow, October 30, and you need to prepare $200 for the 32 GB version or $250 for the 64 GB one. Of course, this is with a new contract. Off -contract price is expected to be around $600 for the more expensive variant. 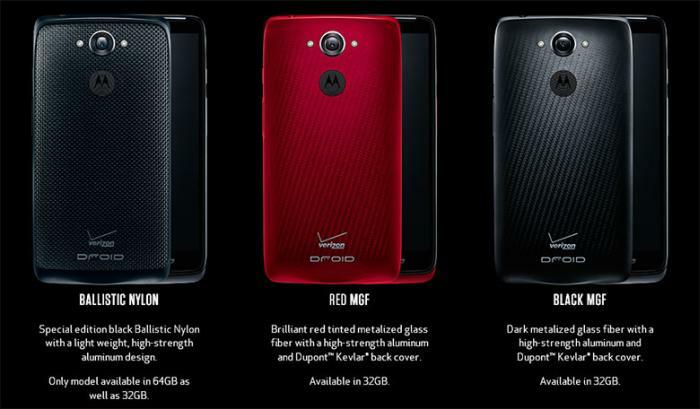 The Droid turbo is offered in black (the material is ballistic nylon), red & black (with metalized glass fiber).